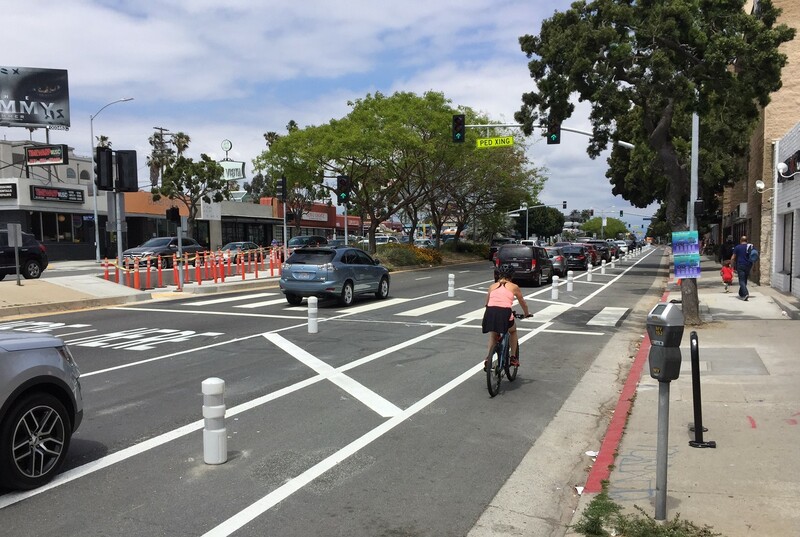 Construction on Mar Vista’s Venice Boulevard Great Streets makeover is not quite complete, but new protected bike lanes and pedestrian crossings are already in use. The improvements extend 0.8-miles along Venice Boulevard from Inglewood Boulevard to Beethoven Street in the City of Los Angeles’ Mar Vista neighborhood. This stretch of Venice Blvd was included at the outset of the mayoral Great Streets Initiative announced in 2014. It is also one of the 40 dangerous priority corridors identified in the city’s Vision Zero Action Plan. According to a city fact sheet, since 2011, this stretch has seen 48 pedestrians and cyclists seriously injured in crashes. Additionally, city speed surveys found 15-18 percent of drivers breaking speeding laws by exceeding the 40 mph speed limit. 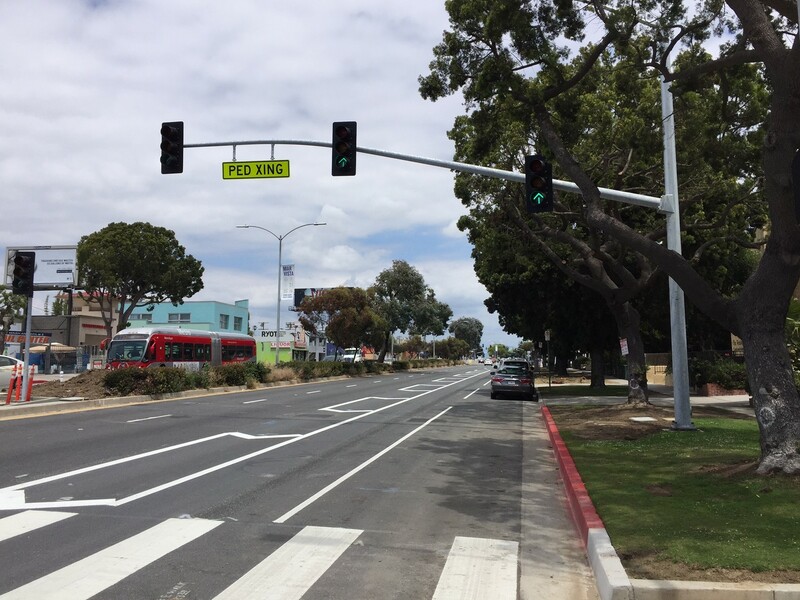 The current improvements were the subject of an extensive community input process that got underway in 2015, under the leadership of City Councilmember Mike Bonin, the Mar Vista Community Council and the Mar Vista Chamber of Commerce. 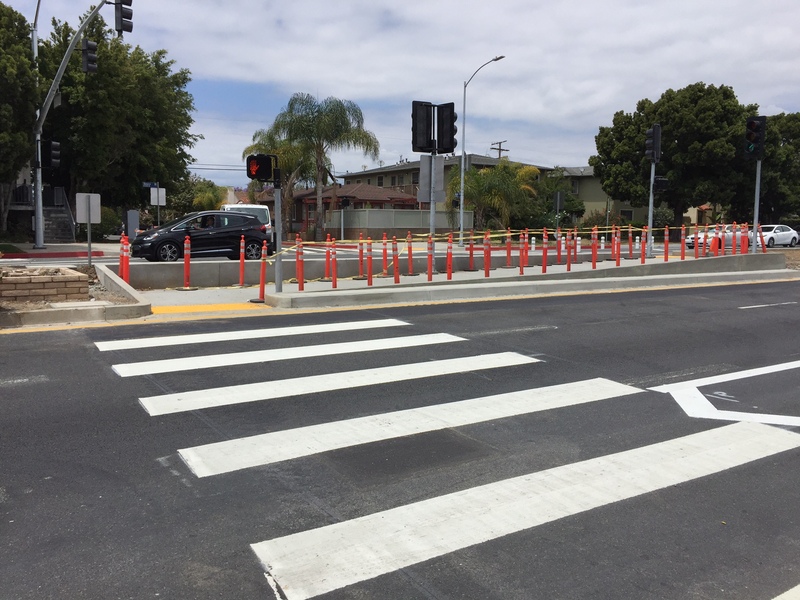 Protected bike lanes, new mid-block crossings, and a road diet were announced in 2016, but were delayed as the city sought and obtained control of the street which had been overseen by Caltrans. The project broke ground in February and construction is still underway, but appears nearly complete. For many years, it has been difficult for pedestrians to cross Venice Blvd. Though the street has a landscaped median island, pedestrians were only officially able to get across at signalized intersections every 3-4 blocks. 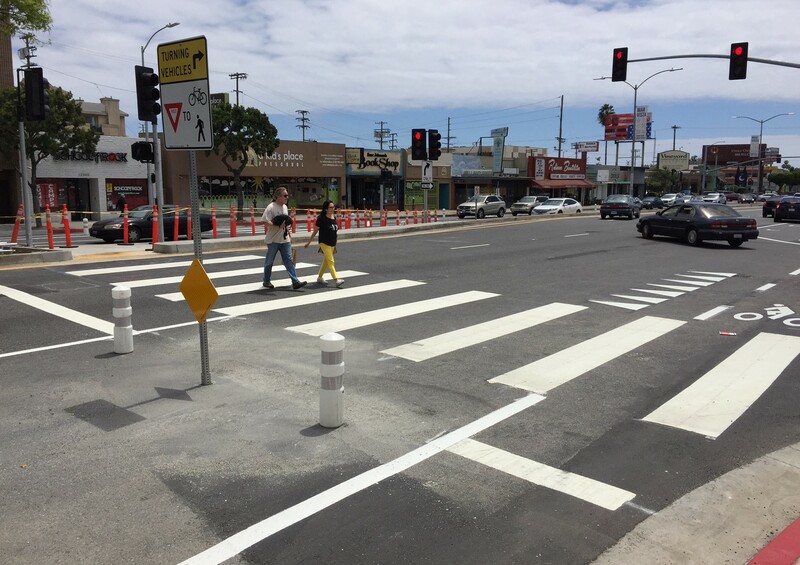 The Great Streets project has added four new mid-block pedestrian crossings. Technically these are perhaps not “mid-block” but are located at smaller formerly un-crossable un-signalized intersections at Mountain View Avenue, Ocean View Avenue, Boise Street, and Meier Street. Each site includes a pair of offset crosswalks extending from sidewalks to a median refuge, plus new signals. New Venice Boulevard pedestrian crossing signal at Boise Street. The residential portion on the south side of Venice Boulevard west of Wasatch Avenue features a buffered bike lane. The project also included a road diet reducing through-traffic lanes from three in each direction to just two, and adding parking-protected bike lanes. These are the city’s third parking-protected bike lanes, after similar Great Streets improvements on Reseda Boulevard, and Van Nuys Boulevard. 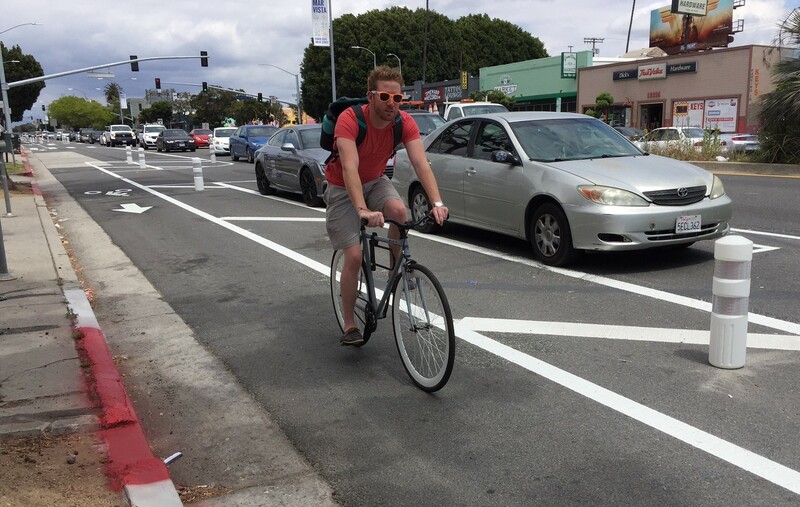 Venice Blvd is just the city’s seventh protected bike lane facility. According to the Great Streets website, the project also includes leading pedestrian intervals and upgrading of existing crosswalks. Then she was an idiot. Do you have any data to back up your claims of 100%, increased accidents and cars not being able to make turns or is it just a rant? … yup, just a rant. Solution to your confusion – move to a less populated area. Literally anywhere – please. go.